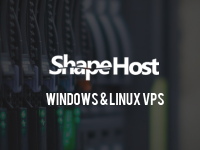 ShapeHost is now offering a huge discount on Windows VPS Server! Save 35% OFF on any VPS plans, this is what you’ve been waiting for! Hurry and grab the ShapeHost coupon below!